After a three-month stay at the great monastery the two missionaries were ready for to undertake the final long journey to Lhasa. They headed south and for a while traveled with a huge caravan which consisted of 15000 yaks, 1,200 horses, the same number of camels and 2000 men. On the 29th of January 1846, after a grueling 18 months on the road the weary but elated missionaries finally arrived at their goal — Lhasa. The golden spires of the Potala Palace, the richness of the Jokung Cathedral and the color of the pilgrims and merchants from every part of Central Asia were all overwhelming. But they had not come to sight-see and as soon as they found accommodation they began planning to conquer for Christ this citadel of paganism. When the authorities knew their presence they received an order to appear before the Regent, ruler of Tibet until the young Dalai Lama came of age. Full of trepidation and hope they obeyed. The Regent happened to be an urbane and deeply religious man and as soon as he was satisfied that the strangers were not spies but genuine men of religion, he became friendly towards them. When he asked why they were in his realm they told him that they had come to convert the Tibetans the one true religion. Far from being perturbed or angry, the Regent was delighted. Hue recorded his words; "All your long journeys were made for a religious purpose. You are right, for man’s business in life is religion. I see that you French and we Tibetans are one in this. But your religion and ours are not the same so it is important to find out which one is true. We shall therefore examine them both carefully and sincerely. If yours is true, we shall adopt it. Indeed, how could we not? But if ours is found to be true, I hope you will be reasonable enough to adopt it yourself". The missionaries could hardly have wished for a more positive reception. It seemed that all their prayers had been answered. In the following month the three men met often, had long discussions and gradually developed a genuine respect for each other. The Regent arranged for them to learn more Tibetan so they could more clearly explain their beliefs, found them more comfortable accommodation and purchased their horses at a very generous price thus giving them much needed extra cash. As at Kumbum, curious and interested people began visiting them, some of them on a regular basis, to find out about the new religion. But just when it looked like all the missionary’s prayers had been answered, disaster struck. The Chinese ambassador had been trying for some time to have the missionaries expelled but the Regent had put him off, found excuses to do nothing or used delaying tactics. Now Chinese pressure became intense and the Regent and his government finally had to give in. After a friendly farewell from the Regent and an invitation to come again at a better time, the two men left the Forbidden City and headed east towards China. Huc and Gabet arrived in Macao in October 1846 full of plans to establish a mission in Lhasa but their dreams were soon to be dashed. They learned that the Vatican had granted the Society des Missions Etrangeres the exclusive right to preach the Gospel in Tibet and they were not prepared to let Lazerists or any other Order poach on what they now considered to be their turf. As it happens, the Society des Missions Etrangeres was never able to get around to organizing a Tibetan mission and indeed no Catholic or even Protestant missionaries were ever to step foot in Lhasa again. Thus ironically it was not Buddhist resistance but ecclesiastical rivalry and polities within the Catholic Church which prevented the Gospel being preached in the fabled Forbidden City. Father Gabet went to Rome to plead to be able to return to Tibet but was unable to reverse the decision. He was eventually posted to Brazil where the friendship he had cultivated with Tibet’s regent, the language skills he had learned in China and Tibet and his knowledge of the region were all wasted. He died of yellow fever in 1853. Father Huc remained in Macao for two years writing an account of the mission. In 1852 he returned to France but never really recovered from the hardships of his long journey and he died in 1860 worn out at the age of 47. 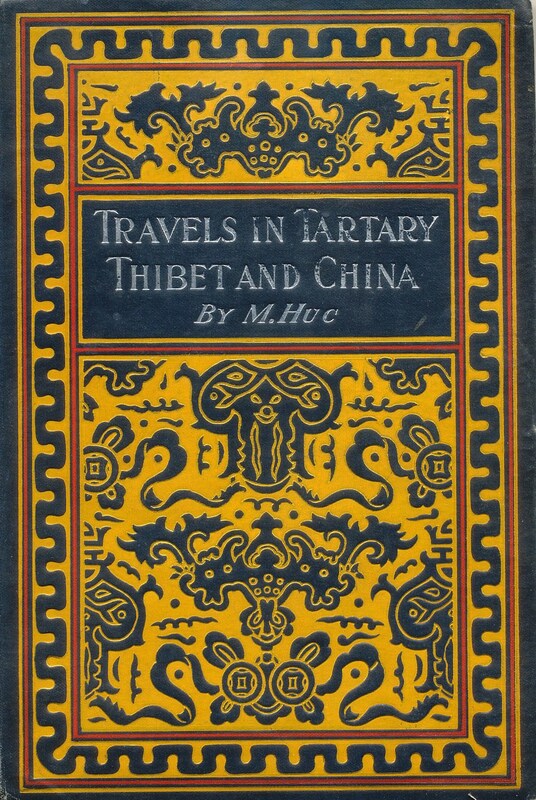 This three-volume travelogue attracted much attention in academic circles, being the only first-hand acco unt of Lhasa to appear during the whole of the 19th century. It went through several editions and was translated into English. Huc’s account of the Tree of Ten Thousand Images in particular created much interest. The idea of such a tree sounded so improbable and yet in all other matters Huc seemed to be a careful and objective informant. Further, as a Catholic missionary hostile to all aspects of Tibetan Buddhism, he had no reason to say anything positive about it. Unfortunately, the truth about the wonderful tree can now never be known for certain. The British traveler Peter Flemming saw it in 1935 but it was autumn and it had shed its leaves. Andre Migot saw it in 1946 but by then it had been enclosed in a temple and he was unable to examine it carefully. Communist Red Guards destroyed the Tree of Ten Thousand Images in the 1960’s. Thanks for the musings about Huc and Gabet. For some photos see Kumbum Monastery.